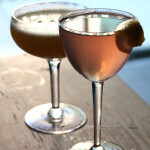 That also means Tru Normand has a cocktail program worth exploring. 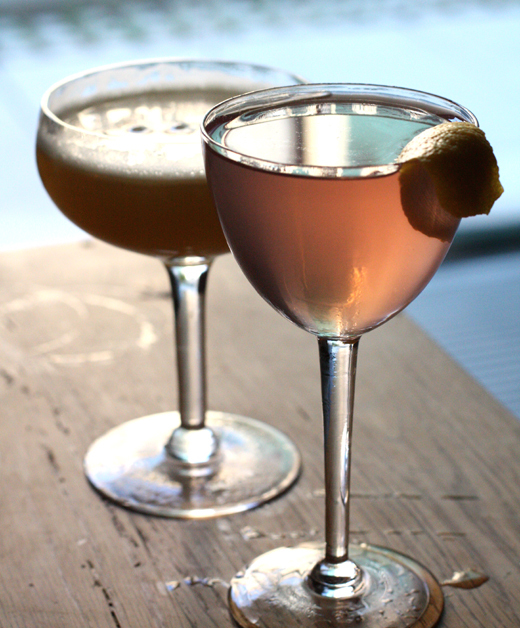 The cocktails are based on turn-of-the-century recipes made with small-batch spirits. If only all fruit cups could be like this. The “Fruit Cup” ($15) is one of the prettiest cocktails around. A single slender brick of ice dangles inside the glass. Because it melts more slowly than regular, smaller ice cubes, your drink never gets watered down, even for someone like myself who usually sips the same cocktail throughout the entire dinner. A long orange peel wraps around the inside of the glass. 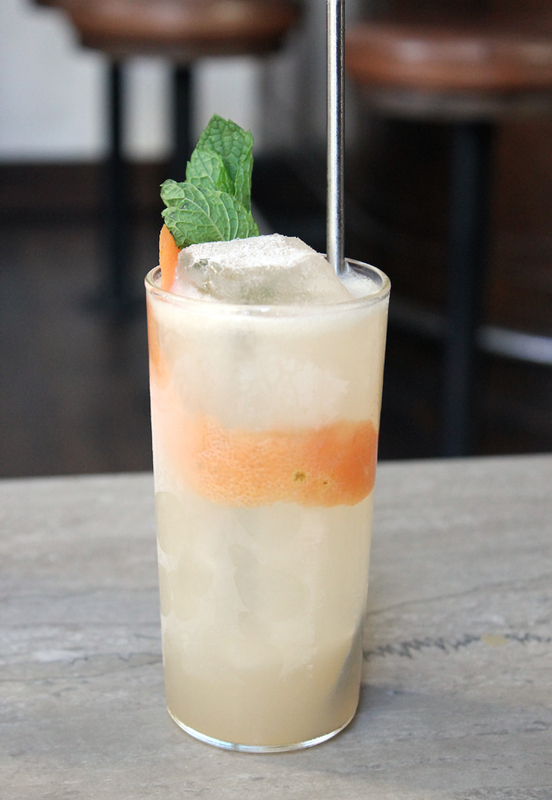 The cocktail, a blend of gin, lemon, apertivo, ginger and bitters, tastes like a liquid tangerine gum drop without the cloying sweetness. Instead, the bitters really heighten the bitter-sweet taste of citrus rind. The charcuterie board with four selections. The charcuterie is a must here. 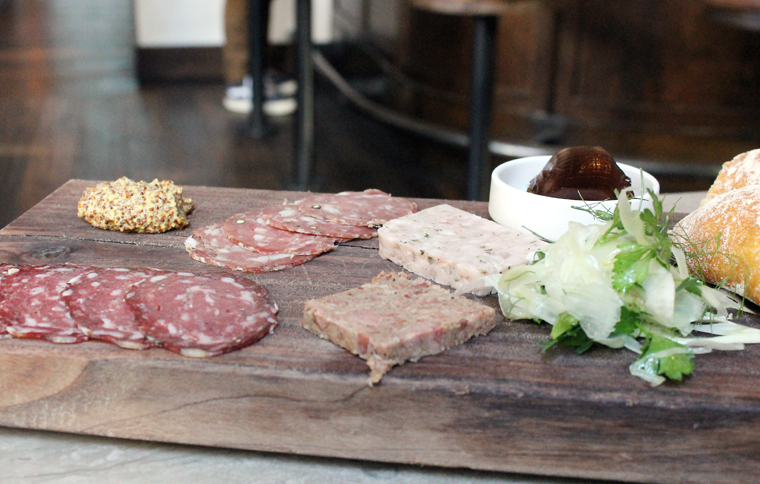 For $26, the chef will choose four selections of salumi and charcuterie to array on a big wooden board. Ours came with lamb salame redolent of rosemary and garlic; French country salame with plenty of black pepper; mild rabbit pate seasoned with herbes de Provence and honey; and pork rillettes with blueberry, sage and ginger. Alongside was a loaf of crusty bread, whole-grain mustard, fennel salad, and a small bowl of wiggly aspic. Tear off some bread and have at it. There’s also a larger charcuterie board with eight selections ($52) and one with 12 selections ($78), making this a fine way to break bread with a group or to even have as your entire dinner with a glass of wine. After all that richness, the melon salad ($13) was the perfect antidote to reset the taste buds. 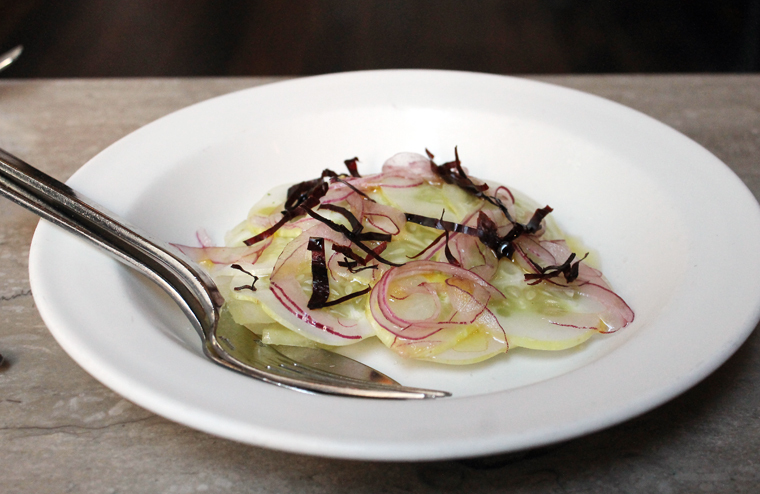 Thinly sliced, the sweet melon was tossed with equally thin rounds of cucumber and slivers of red onion. Melon and cucumber — both so crisp and quenching — are natural partners. It made me want to recreate this at home. 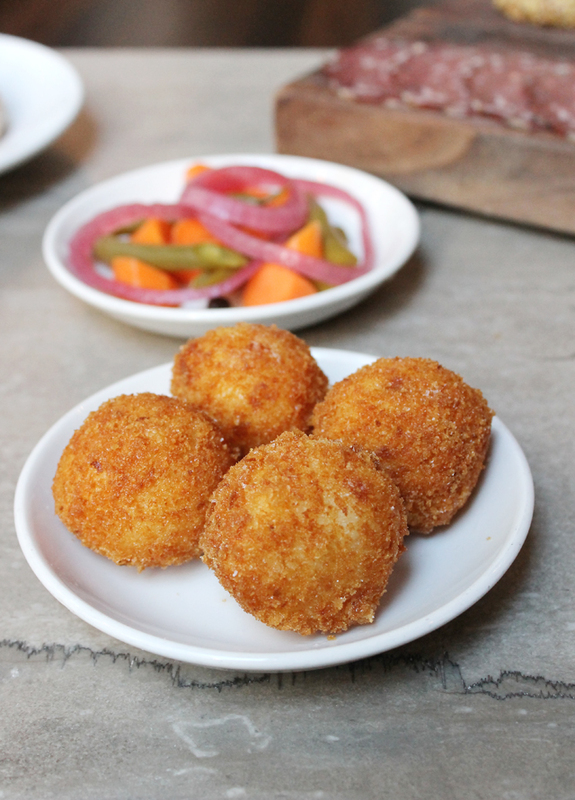 The kitchen sent out an order of arancini ($9). They arrived right out of the fryer, almost too hot to handle and perfectly crisp and deeply golden. These super cheesy risotto balls are to die for. Surprisingly, they’re not overly heavy tasting. Just two bites each, they let you indulge ever so — but not too much. They arrived with house-made pickles ($6), an assortment of crisp and tangy onions, carrots and green beans that go so well with the cured meats. The grilled pork chop ($36) was so massive, I took half of it home. Made from pastured pigs from Riverdog Farms in Guinda, CA, the meat is supremely succulent. One and a half inches of fat rim the chop. Don’t be alarmed. You probably don’t want to eat every inch of it, but do indulge in some of the fat. 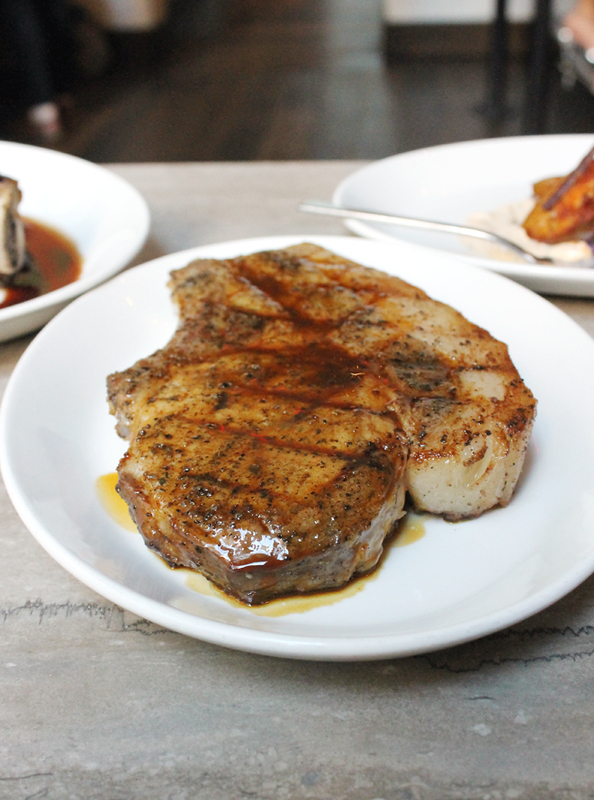 It’s juicy, porky wonderfulness that will linger on your palate. Again, I remind you this is the smaller sized beef chop. Yup. 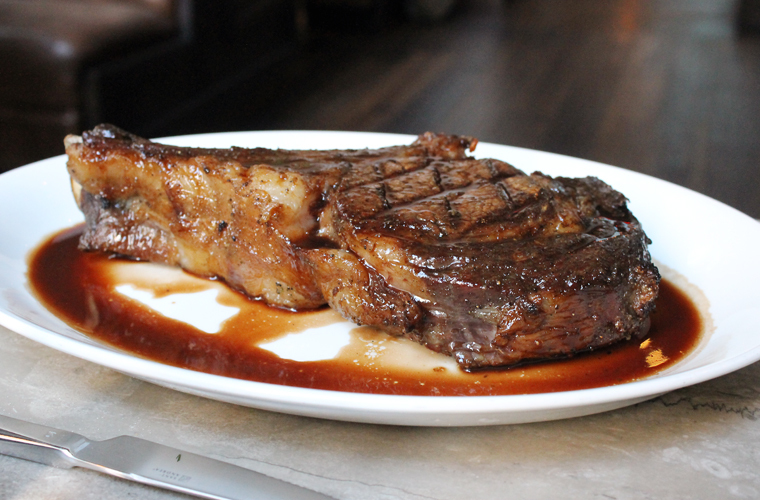 The grilled beef chop came in two sizes ($67 and $81). My husband wisely asked the difference in sizes before ordering. With the “smaller” size weighing in at 28 ounces and the “large” size coming in at 36-ounces, Meat Boy actually opted for the former. Thank goodness, too. Because what arrived on the plate was so humongous, my eyes fairly popped out, and I almost thought the kitchen had accidentally sent out the larger-sized chop. But nope, this was the, ahem, small one. 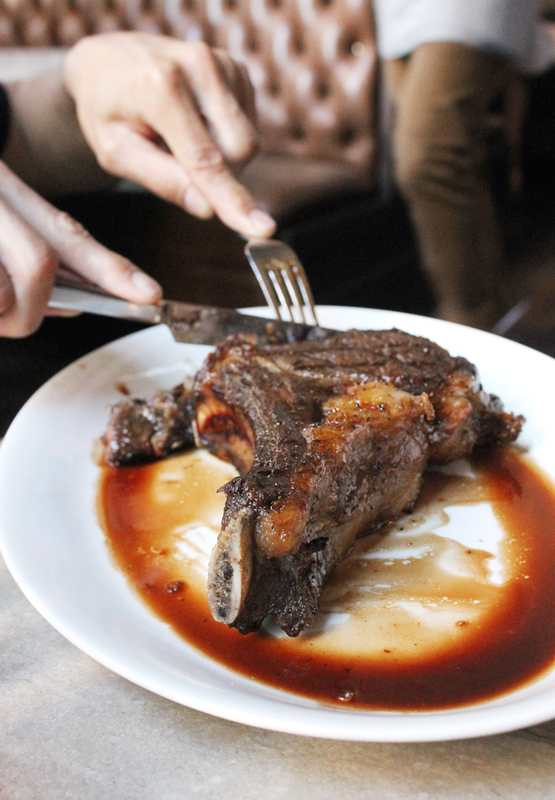 It’s essentially a bone-in rib eye, making it ever so tender and exquisitely beefy tasting. We took half of that home, too. 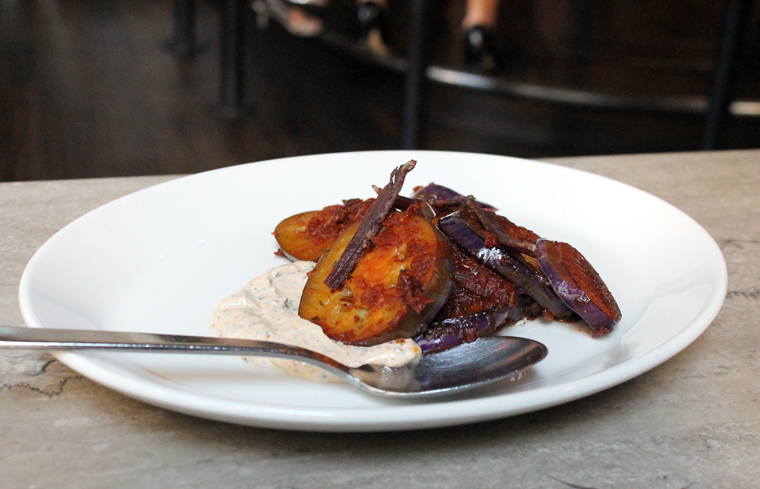 To go with that meat fest, we shared a side of Japanese eggplant ($16), cooked in Moroccan flavors with chili and yogurt. And oh yes, there were some thin slivers of lamb pancetta mixed in for good meaty measure. After all that meat and fat, what’s a little butter? OK, maybe a lot of butter. 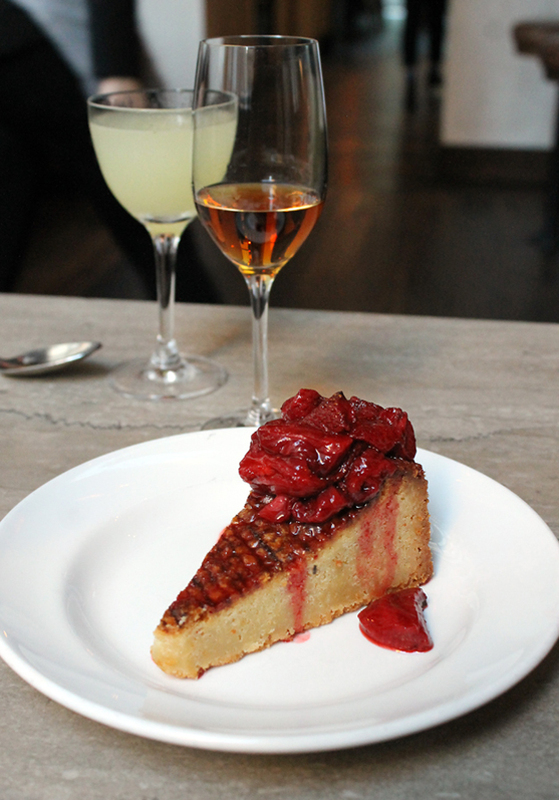 The butter cake ($13) was like pound cake meets shortbread cookie. The dense, moist, exceedingly buttery cake was homey and wonderful, especially with its topping of roasted strawberries, their taste concentrated into thick jamminess. Butter cake. Just go for it. A glass of tart, invigorating ginger-lime digestive for my husband (designated driver) and a glass of 1986 Calvados for me were perfect accompaniments. 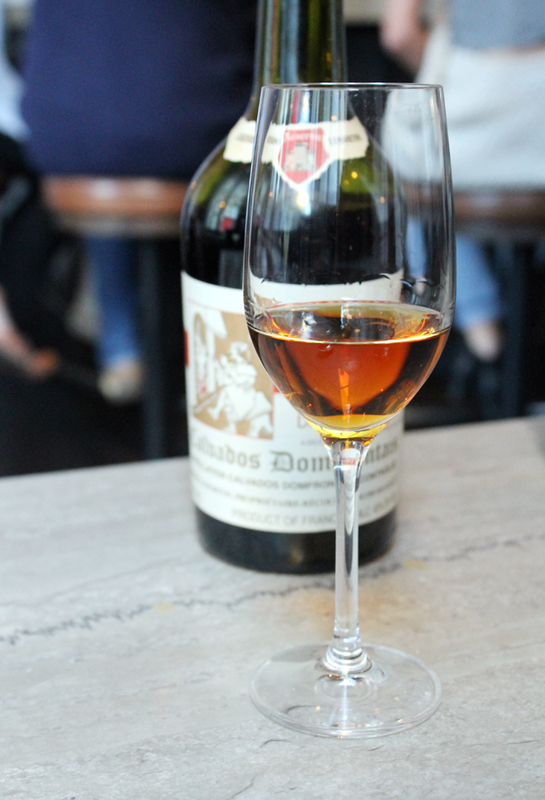 Sipping the smooth, spicy, caramel-y brandy, I couldn’t help but think to myself that Trou Normand — both the French practice and the South of Market restaurant — is definitely something I can get used to. Gosh, Meat Boy must have been in heaven! And you guys were probably in a food coma for days huh? 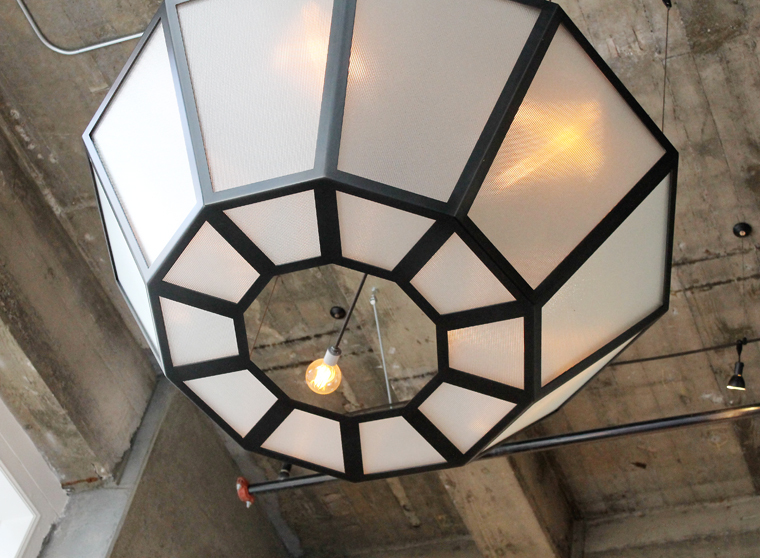 The restaurant looks beautiful and I’m a fan of Bar Agricole, but not sure if Trou Normand is for me. It really seems like a steakhouse, and the prices look like they’re trying to shoot for the tech audience. That’s fine, though, because it’s nice to have a variety of food options in the city.